Maiduguri, 10 April, 2019 - With on-going Measles outbreak in Borno State, the World Health Organization (WHO), the Federal and State authorities, Gavi, the Vaccine alliance and Measles partners are organizing a 2-phase vaccination campaign to protect children aged between 6 and 71 months against the disease. During the first phase, 437,515 children were successfully vaccinated while 838,582 children more will be targeted in the second phase. Nigeria is currently experiencing a large outbreak of Measles with 11,603 suspected cases including 27 deaths reported from all 36 states and the Federal Capital Territory since the beginning of the year. This represents a significant increase compared with the 4,764 suspected cases reported across the country, during the same period in 2018. With 8,092 suspected cases including 6,560 children under-five years, Borno is the most affected states. The Maiduguri Metropolitan Council area alone reported close to 6,560 suspected cases followed by Jere (1,040) and Bama (740) Local Government Areas. In total, 22 LGAs and 28 internally displaced camps are affected by the outbreak. “Immunization is the only effective preventive measure against acquiring measles”, says Dr Babagana Abiso, Director for Disease Control, Borno State Primary Health Care Development Agency. “With a high level of un-immunized children, low coverage of routine measles immunization and recent population displacement in Borno State, this reactive vaccination campaign is critical to protect children against the disease”, he adds. 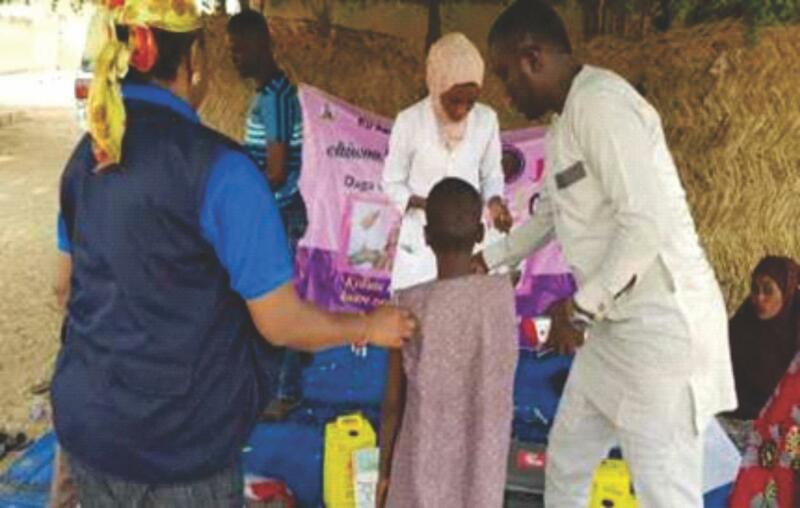 In collaboration with Federal and State Primary Health Care Development Agencies, UNICEF, other partners and financial support from Gavi, the Vaccine Alliance, WHO organized a reactive vaccination campaign in Borno State to protect children and prevent further infections. Targeting more than 1.2 million children between 06 and 71 months years across 13 LGAs, the campaign is in 2 phases with the first round conducted from 21-25 March and the second in April/May 2019. Upon the completion of the first phase, 437,515 children have already been vaccinated against measles in eight wards of Maiduguri, the Borno State capital. An additional 838,582 children will be vaccinated during the next phase of in late April and beginning of May 2019 in the remaining wards and LGAs reporting measles outbreaks. A highly infectious disease, measles can cause life-threatening complications and disability, including blindness especially in young children. The disease is transmitted through contact with the nose and throat secretions of infected people released into the air when an infected person sneezes or coughs. It can spread easily in areas with low immunization coverage. Measles is however preventable through vaccination. “The whole camp was very concerned. Several children were falling sick at the same time. When they fell sick, we spend all our time looking after them and cannot engage in any other activities”, settlement says Yakura Ibrahim, a mother of three children in Hausari ward of Maiduguri, Borno State. Welcoming the ongoing vaccination campaign, she adds, “When we heard that all of our children and those in other communities will be given vaccine to protect them, we felt very happy. No parent wants to see his or her children unwell and potentially in danger”. The current vaccination campaign entails logistic preparation, advocacy visits, technical assistance to local authorities, and community engagement amplify the impact of this campaign and ensure that missed children are reached. “This is a very challenging endeavour” said Dr Peter Clement the WHO Officer in Charge for Nigeria. Notwithstanding, “WHO in close collaboration with its partners, remains committed in supporting all States in Nigeria and Borno in particular, in controlling the outbreak. WHO immunization and health emergencies teams work hand in hand to help achieve this objective. Together with our partners and the Federal and State authorities, we can protect more than 1.2 million children against this disease. The measles campaign was made possible with financial support from Gavi, the Vaccine Alliance. Created in 2000, Gavi is a global Vaccine Alliance, bringing together public and private sectors with the shared goal of creating equal access to new and underused vaccines for children living in the world’s poorest countries.